Furniture and fittings, you may be able to change with the time however the flooring is something there for a very long period of time. As choosing your flooring needs lots of effort and also it will cost you a fortune. Also, choosing new flooring for your new home is not an easy task. There are so many options available for flooring materials to choose from a wide range from the market. There are various types of flooring materials are available in the market, so it is bound to happen where people get confused while choosing which flooring material is best for their home. Also Read: Floor Components: All You Like to Know! Amongst all the type of flooring used in the house, “tile flooring” is a very common and popular. The tiles are available in varieties of colours, textures and patterns. Ceramic tile is made up of mixture of clay and water only. It is used in indoor as well as outdoor areas. Ceramic tiles are ideal for wet areas like bathrooms, kitchens, etc. as these tiles are not very slippery as compared to vitrified tiles. Vitrified tile is one type of ceramic tile with low porosity. Vitrified tiles are most commonly used in living room, kitchen, bedroom, etc. They have a glossy finish as compared to ceramic tiles though they are also available in matt finish. Full body vitrified tiles have pigment in entire thickness of the tile. Therefore, scratches are less noticeable in these types of vitrified tiles. Also, when you have to cut the tiles, borders of tiles will be of the same colour. Double charge vitrified tiles are fed through a press that prints the pattern with a double layer of pigment (two kinds of colours are fed into the machine). Therefore, the upper layer becomes 3 to 4 mm thicker. So, it is a viable option where traffic is medium to heavy. Vitrified tiles are printed with screen printing technology and then polished, therefore it is called soluble salt. Glazed Vitrified Tiles (GVT) has a glazed surface. This glazed surface allows any type of design, surface textures, etc. on it. It can increase the aesthetics of the area. Also Read: Vitrified Floor Tiles: Properties You should Know Before Buying it! Porcelain tiles are the type of vitrified tiles. It is not majorly used nowadays. Porcelain tiles can be used in living room, bedroom, etc. It is staining and water resistant. Stone flooring is natural, beautiful, and always stylish that stands out in contrast to any synthetic or manufactured stone products. Natural stone also comes in different types such as granite, marble, limestone, slate, travertine, sandstone, etc. All the types of stone have different characteristics. The naturally cool, hard surface is ideal for warm climates. Marble is a metamorphic rock. When properly finished it can transform the area beautifully. Marble flooring is very common in residential and commercial buildings, temple, hotels, hospitals etc. The most popular marble available in India are Makarana Marble, Italian Marble, Ambaji Green Marble, Kesarayaji Green Marble, etc. It is a better flooring option than granite flooring as it is cheaper. Granite is igneous rock. Granite flooring a is a type of natural stone flooring and it is most suitable for the kitchen area. It is also used in an outdoor area like pathways. Granite flooring does not feel as cold as marble does. The limestone has beautiful textures as they are sedimentary rocks by nature. 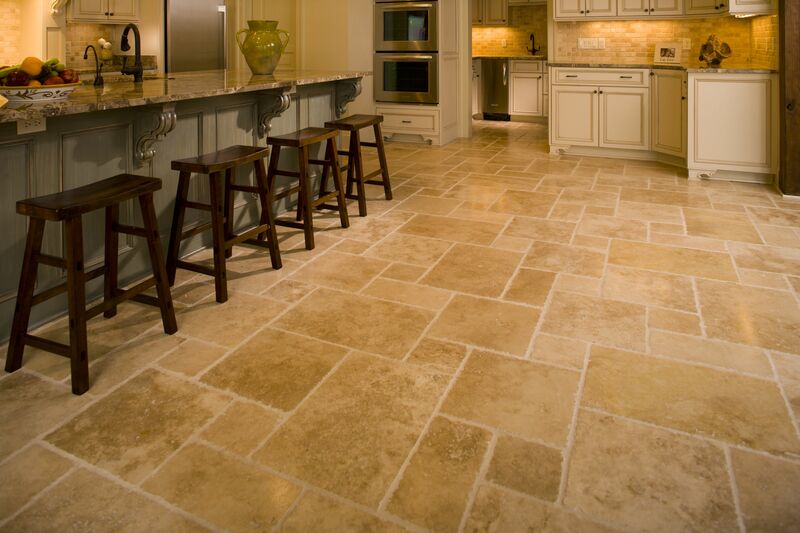 Limestone flooring is perfect choice for bathrooms, dining rooms and hallways. Limestone flooring does not have that pattern as compared sandstone flooring. Sandstone flooring is composed of loose grains of quartz sand that are rough in texture. 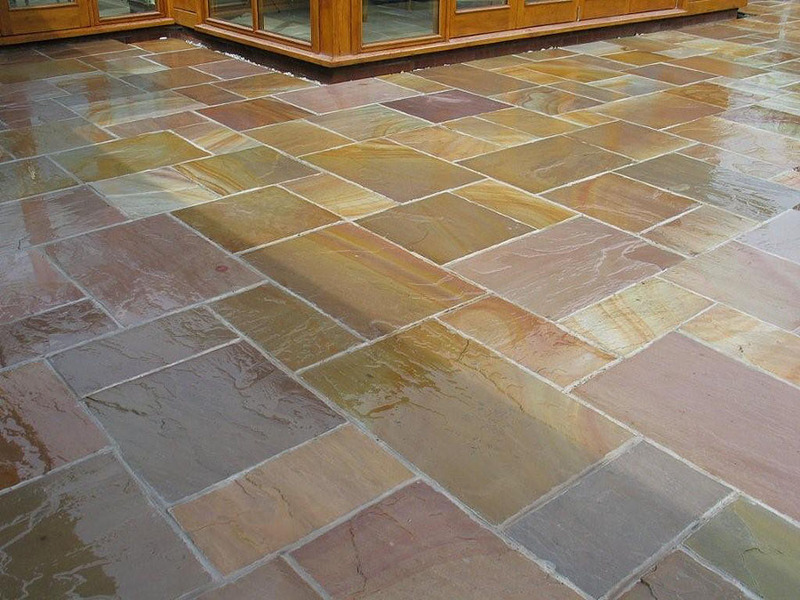 The natural beauty makes sandstone flooring great for interior floors as well as exterior decoration including flooring, paving, parking, etc. Slate flooring is a made up of metamorphic rock that was formed in layers, so it easily splits into thin sheets that are cut into tiles. Rougher surfaces of slate flooring are perfect for entryways, patios and kitchens. Kota Stone is a type of stone flooring. It is cheaper than marble flooring. It can be used in lobby, balcony, pathways, etc. It is not attractive as compared to marble and granite flooring. Cleaning of kota stone flooring is difficult. Nowadays, the travertine is one of the softest floorings available in the market. It is most commonly used in kitchens and bathrooms. Travertine flooring can be more susceptible to staining than granite or marbles. Solid wood flooring is made from a piece of wood which has thickness of around 20 mm. Solid wood flooring can be installed in any room of your house, except in areas where there is high moisture content such as kitchen, bathrooms and basements. 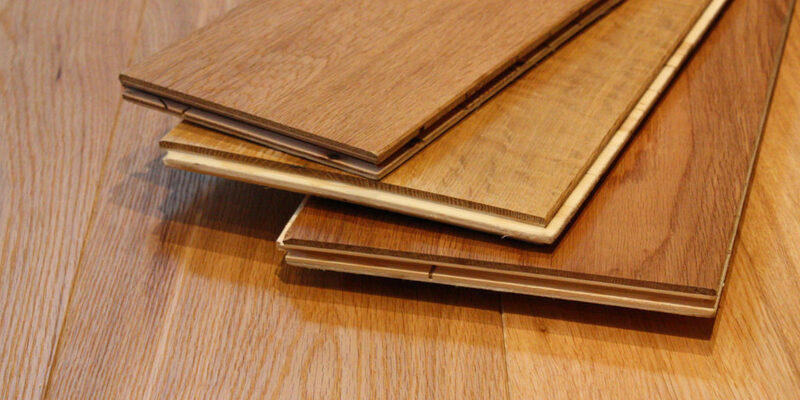 Engineered wood flooring is made with the core of plywood and a layer of solid wood attached on its top. It can be installed even in kitchen areas, apart from other rooms of your house. Engineered wood flooring gives more attractive look than laminate wood flooring. Laminate wood flooring is obtained by placing a layer of a photographic image of wood over a fiberboard. As it is a synthetic product, it does not give look and feel of natural wood. Laminate wood flooring can be installed in any room such as living room, bedroom, and dining room except wet areas like bathroom and laundry rooms. PVC flooring is also known as vinyl flooring. These types of flooring material have a very smooth top surface and a rough lower surface. Vinyl flooring is a good choice for areas that are prone to spills and moisture such as kitchens, bathrooms, laundry rooms, also for offices, etc. China mosaic flooring is very old type of flooring. Mosaics are made from small round pieces of stones. They form nice pattern and give a beautiful look. It is popularly used in the terrace area. Concrete flooring is one of the oldest types of flooring. It is commonly used throughout the world for almost all types of buildings. Concrete flooring is extremely strong and is able to withstand the pressure from very heavy equipment such as cars, trucks, etc. Terrazzo flooring is a concrete surface with special type of marble chips embedded in it. Terrazzo flooring is commonly recommended for bathrooms, dining rooms, offices, hospitals, etc. Mosaic tiles are created by assembling tiny pieces of glass, tiles or natural stones. You can use them in the kitchen, bathroom or bedroom floors. The use of mosaic will give decorative look to your house. Also Read: Way to Check the Quality of Mosaic Tiles at the Site! Glass flooring is not very common, but can be used in aristocratic buildings both residential and public particularly to have smooth and pleasing surface. Glass flooring is generally bacteria and dirt-resistant. Mud flooring is most suitable for Indian conditions and climates. It is commonly used in village areas. Mud flooring is very cheap and hard. It is fairly impervious, easy to construct. However, it is difficult to maintain. Brick flooring is one of the oldest types of flooring materials. It is majorly used in courtyards, stores, godowns, etc. Brick flooring is durable and provides sufficiently hard floor surface. It provides a non-slippery and fire-resistant surface. In carpet flooring, the carpet is made from wool or from synthetic fibers, such as polypropylene, nylon, or polyester. It is the most versatile of all flooring options, featuring more colours and textures than any other types of flooring material. It is a kid’s friendly flooring option used in the kid’s bedroom and also in living room, bedroom, etc. However, cleaning can be issue. Cork is a natural material obtained from the outer bark of cork oak tree. It is available in the form of coloured tiles or sheets. Cork flooring is mostly used in the kitchen, dining areas, etc. This type of flooring material is environmentally friendly. Cork flooring is considered a renewable and sustainable natural resource. Linoleum flooring is made of linseed oil, wood or cork powder, and ground stone. It is recyclable material and available in different colours, styles and patterns and resists water easily. It is most commonly used in kitchen, bathroom and laundry rooms. Rubber flooring is most popular in Asian Countries. This type of flooring is noiseless, comfortable in walking, and very durable. The initial cost of rubber flooring is a little bit high. It gives excellent wearing surface. In chemical laboratories, acid manufacturing factories, storage battery factory buildings and such other places where the floor is subjected to the actions of acid, such types of floor finishing are used. Magnesite flooring consists of calcined magnesite, magnesium chloride, wood dust, ground quartz or silica and fine powdered wood waste. 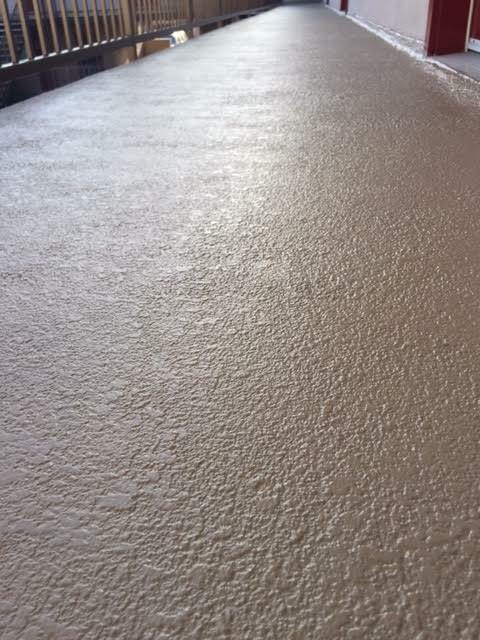 It is used as finishing surface on concrete floor slabs. It is also known as the composition of a “jointless floor”. These types of flooring, though not very common, is cheap, gives a smooth surface and can be laid jointless on the rough surface as the material is flexible. The choices of flooring materials are forever growing and a wide range is available to suit your needs. You can choose different types of flooring materials that are hard or soft and pick from a wide range of variety of styles and colours. Don’t forget, you are going to use your flooring every minute in your house, so choose well and carefully. Without great flooring, a house can never be great. Next PostNext What Should be the Standard Room Size & Location for a Residence?